A peanut solution given under the tongue can desensitize a child's deadly peanut allergies, but further testing will be needed to determine if it may permanently eliminate their reactions to the foods, according to researchers from Duke University Medical Center. University of Alberta researchers have linked the reproductive ecology of polar bears in Hudson Bay with declining litter sizes and loss of sea ice. Molnar and U of A colleagues Andrew Derocher and Mark Lewis used data collected beginning in the 1990s to analyze how long, during the polar bear’s hunting season, Hudson Bay is frozen over and the amount of energy pregnant females can store up before denning and birthing. “An early spring-ice break up reduces the hunting season, making it difficult for pregnant females to even support themselves, let alone give birth to and raise cubs,” said Derocher. Pregnant polar bears take to a maternity den for up to eight months and during this time no food is available and they survive on their fat stores. In the early 1990s, researchers estimate, 28 per cent of energy-deprived pregnant polar bears in the Hudson Bay region failed to produce a litter. Researchers say energy-deprived pregnant females will either not enter a maternity den or they will naturally abort. · If spring break up in Hudson Bay comes one month earlier than in the 1990s, 40 to 73 per cent of pregnant female polar bears will not reproduce. · If the ice breaks up two months earlier than in the 1990s, 55 to a full 100 per cent of all pregnant female polar bears in western Hudson Bay will not have a cub. The polar-bear population of western Hudson Bay is currently estimated to be around 900, which is down from 1,200 bears in the past decade. The number of polar bears across the Arctic is estimated to be between 20,000 and 25,000. A team of engineers from Imperial College London have developed a contraption made of human hair, enabling presenters from the world’s longest running children’s television program to test the theory behind a fairytale. The producers from the children’s television program Blue Peter approached Imperial’s Dr Andrew Phillips, asking him and senior technician Ron Millward to help them to build a rig that would enable them to test the strength of hair. The TV show wanted to see if hair could support the weight of a human, as it did in the fairytale “Rapunzel”. In the fairytale, Rapunzel throws her extremely long hair out of her window, enabling a prince to use it like rope and climb into her room at the top of a tower to attempt a rescue. In the CBBC video clip, watch the demonstration and see what happens to the Blue Peter presenter when some of the strands are snipped off. The main problem that the team had to overcome when they were building the wooden rig was finding a way to fix the strands of hair securely. The team borrowed an old technique, normally used to make ropes, which involved them splaying the hair out and then gluing it into conical holes that were bored into the rig. They then hammered blocks of wood called ‘bungs’ into the conical holes, ensuring that the hair was held in place securely. The team also plaited the hair, which reinforced its strength and ensured that the weight was distributed evenly across the rig . The researchers also carried out tests in the lab, using lead weights, to ensure that the device would not fall apart during the demonstration on TV. After Dr Phillips’s team built the harness, it was driven to the Blue Peter studios in BBC Television Centre, where presenter Andy Akinwolere was suspended in the harness one metre above the ground. At the end of the TV experiment, the Imperial researchers were awarded Blue Peter badges for their efforts. University of Arizona researchers have cracked one of the puzzles surrounding what has been called "the world's most mysterious manuscript" – the Voynich manuscript, a book filled with drawings and writings nobody has been able to make sense of to this day. Using radiocarbon dating, a team led by Greg Hodgins in the UA's department of physics has found the manuscript's parchment pages date back to the early 15th century, making the book a century older than scholars had previously thought. This tome makes the "DaVinci Code" look downright lackluster: Rows of text scrawled on visibly aged parchment, flowing around intricately drawn illustrations depicting plants, astronomical charts and human figures bathing in – perhaps – the fountain of youth. At first glance, the "Voynich manuscript" appears to be not unlike any other antique work of writing and drawing. But a second, closer look reveals that nothing here is what it seems. Alien characters, some resembling Latin letters, others unlike anything used in any known language, are arranged into what appear to be words and sentences, except they don't resemble anything written – or read – by human beings. Hodgins, an assistant research scientist and assistant professor in the UA's department of physics with a joint appointment at the UA's School of Anthropology, is fascinated with the manuscript. "Is it a code, a cipher of some kind? People are doing statistical analysis of letter use and word use – the tools that have been used for code breaking. But they still haven't figured it out." Currently owned by the Beinecke Rare Book and Manuscript Library of Yale University, the manuscript was discovered in the Villa Mondragone near Rome in 1912 by antique book dealer Wilfrid Voynich while sifting through a chest of books offered for sale by the Society of Jesus. Voynich dedicated the remainder of his life to unveiling the mystery of the book's origin and deciphering its meanings. He died 18 years later, without having wrestled any its secrets from the book. Fast-forward to 2009: In the basement underneath the UA's Physics and Atmospheric Sciences building, Hodgins and a crew of scientists, engineers and technicians stare at a computer monitor displaying graphs and lines. The humming sound of machinery fills the room and provides a backdrop drone for the rhythmic hissing of vacuum pumps. Carbon-14 is a rare form of carbon, a so-called radioisotope, that occurs naturally in the Earth's environment. In the natural environment, there is only one carbon-14 atom per trillion non-radioactive or "stable" carbon isotopes, mostly carbon-12, but with small amounts of carbon-13. Carbon-14 is found in the atmosphere within carbon dioxide gas. Pointing to the front end of the mass spectrometer, Hodgins explains the principle behind it. A tiny sample of carbon extracted from the manuscript is introduced into the "ion source" of the mass spectrometer. "This causes the atoms in the sample to be ionized," he explained, "meaning they now have an electric charge and can be propelled by electric and magnetic fields." "Carbon-14 is heavier than the other carbon isotopes," Hodgins said. "This way, we can single out this isotope and determine how much of it is present in the sample. From that, we calculate its age." "I sat down with the Voynich manuscript on a desk in front of me, and delicately dissected a piece of parchment from the edge of a page with a scalpel," Hodgins says. "Because we were sampling from the page margins, we expected there are a lot of finger oils adsorbed over time," Hodgins explains. "Plus, if the book was re-bound at any point, the sampling spots on these pages may actually not have been on the edge but on the spine, meaning they may have had adhesives on them." "The modern methods we use to date the material are so sensitive that traces of modern contamination would be enough to throw things off." "In radiocarbon dating, there is this whole system of many people working at it," he said. "It takes many skills to produce a date. From start to finish, there is archaeological expertise; there is biochemical and chemical expertise; we need physicists, engineers and statisticians. It's one of the joys of working in this place that we all work together toward this common goal." The UA's team was able to push back the presumed age of the Voynich manuscript by 100 years, a discovery that killed some of the previously held hypotheses about its origins and history. Elsewhere, experts analyzed the inks and paints that makes up the manuscript's strange writings and images. "It would be great if we could directly radiocarbon date the inks, but it is actually really difficult to do. First, they are on a surface only in trace amounts" Hodgins said. "The carbon content is usually extremely low. Moreover, sampling ink free of carbon from the parchment on which it sits is currently beyond our abilities. Finally, some inks are not carbon based, but are derived from ground minerals. They're inorganic, so they don't contain any carbon." "It was found that the colors are consistent with the Renaissance palette – the colors that were available at the time. But it doesn't really tell us one way or the other, there is nothing suspicious there." "The text shows strange characteristics like repetitive word use or the exchange of one letter in a sequence," he says. "Oddities like that make it really hard to understand the meaning." "There are types of ciphers that embed meaning within gibberish. So it is possible that most of it does mean nothing. There is an old cipher method where you have a sheet of paper with strategically placed holes in it. And when those holes are laid on top of the writing, you read the letters in those holes." "Who knows what's being written about in this manuscript, but it appears to be dealing with a range of topics that might relate to alchemy. Secrecy is sometimes associated with alchemy, and so it would be consistent with that tradition if the knowledge contained in the book was encoded. What we have are the drawings. Just look at those drawings: Are they botanical? Are they marine organisms? Are they astrological? Nobody knows." "I find this manuscript is absolutely fascinating as a window into a very interesting mind. Piecing these things together was fantastic. It's a great puzzle that no one has cracked, and who doesn't love a puzzle?" Why do some people fret over the most trivial matters while others remain calm in the face of calamity? Researchers at the University of California, Berkeley, have identified two different chinks in our brain circuitry that explain why some of us are more prone to anxiety. Their findings, published in the journal Neuron may pave the way for more targeted treatment of chronic fear and anxiety disorders. Such conditions affect at least 25 million Americans and include panic attacks, social phobias, obsessive-compulsive behavior and post-traumatic stress disorder. In the brain imaging study, researchers from UC Berkeley and Cambridge University discovered two distinct neural pathways that play a role in whether we develop and overcome fears. The first involves an overactive amygdala, which is home to the brain’s primal fight-or-flight reflex and plays a role in developing specific phobias. The second involves activity in the ventral prefrontal cortex, a neural region that helps us to overcome our fears and worries. Some participants were able to mobilize their ventral prefrontal cortex to reduce their fear responses even while negative events were still occurring, the study found. “This finding is important because it suggests some people may be able to use this ventral frontal part of the brain to regulate their fear responses – even in situations where stressful or dangerous events are ongoing,” said UC Berkeley psychologist Sonia Bishop, lead author of the paper. “If we can train those individuals who are not naturally good at this to be able to do this, we may be able to help chronically anxious individuals as well as those who live in situations where they are exposed to dangerous or stressful situations over a long time frame,” Bishop added. Bishop and her team used functional Magnetic Resonance Imaging (fMRI) to examine the brains of 23 healthy adults. As their brains were scanned, participants viewed various scenarios in which a virtual figure was seen in a computerized room. In one room, the figure would place his hands over his ears before a loud scream was sounded. But in another room, the gesture did not predict when the scream would occur. This placed volunteers in a sustained state of anticipation. Participants who showed overactivity in the amygdala developed much stronger fear responses to gestures that predicted screams. A second entirely separate risk factor turned out to be failure to activate the ventral prefrontal cortex. Researchers found that participants who were able to activate this region were much more capable of decreasing their fear responses, even before the screams stopped. The discovery that there is not one, but two routes in the brain circuitry that lead to heightened fear or anxiety is a key finding, the researchers said, and it offers hope for new targeted treatment approaches. If you thought that we know everything about how the flea jumps, think again. In 1967, Henry Bennet-Clark discovered that fleas store the energy needed to catapult themselves into the air in an elastic pad made of resilin. However, in the intervening years debate raged about exactly how fleas harness this explosive energy. Bennet-Clark and Miriam Rothschild came up with competing hypotheses, but neither had access to the high speed recording equipment that could resolve the problem. Turn the clock forward to Malcolm Burrows' Cambridge lab in 2010. 'We were always very puzzled by this debate because we'd read the papers and both Henry and Miriam put a lot of evidence for their hypotheses in place and their data were consistent with each other but we couldn't understand why the debate hadn't been settled,' says Burrows' postdoc, Gregory Sutton. He adds, 'We had a serendipitous set of hedgehog fleas show up so we figured we'd take a crack at it and try to answer the question'. Filming leaping fleas with a high-speed camera, Sutton and Burrows found that fleas push off with their toes (tarsus) and publish their discovery in The Journal of Experimental Biology at http://jeb.biologists.org/cgi/content/abstract/214/5/836. 'We were concerned about how difficult it would be to make the movies because we are used to filming locusts, which are much bigger than fleas,' admits Sutton, but he and Burrows realised that the fleas stayed perfectly still in the dark and only jumped when the lights went on. Focusing the camera on the stationary insects in low light, the duo successfully filmed 51 jumps from 10 animals; and this was when they got their first clue as to how the insects jump. In the majority of the jumps, two parts of the flea's complicated leg – the tarsus (toe) and trochanter (knee)– were in contact with the ground for the push off, but in 10% of the jumps, only the tarsus (toe) touched the ground. Sutton explains that Rothschild had suggested that fleas push off with the trochanter (knee), but if 10% of the jumps didn't use the trochanter (knee) was it really necessary, or were the fleas using two mechanisms to get airborne? Burrows and Sutton needed more evidence. Analysing the movies, the duo could see that the insects continued accelerating during take-off, even when the trochanter (knee) was no longer pushing down. And the insects that jumped without using the trochanter (knee) accelerated in exactly the same way as the insects that jumped using the trochanter (knee) and tarsus (toe). Also, when Burrows and Sutton looked at the flea's leg with scanning electron microscopy, the tibia (shin) and tarsus (toe) were equipped with gripping claws, but the trochanter (knee) was completely smooth, so it couldn't get a good grip to push off. Sutton and Burrows suspected that the insects push down through the tibia (shin) onto the tarsus (toe), as Bennet-Clark had suggested, but the team needed one more line of evidence to clinch the argument: a mathematical model that could reproduce the flea's trajectory. 'I looked at the simplest way to represent both models,' explains Sutton. Building Rothschild's model as a simple mass attached to a spring pushing down through the trochanter (knee) and Bennet-Clark's model as a spring transmitting the spring's force through a system of levers pushing on the tarsus (toe), Sutton generated the equations that could be used to calculate the insect's trajectory. Then he compared the results from his calculations with the movies to see how well they agreed. Both models correctly predicted the insect's take-off velocity at 1.35m/s, but then the Rothschild model began to go wrong. It predicted that the insect's acceleration peaked at a colossal 22,000m/s2 (2200g), whereas the acceleration of the insects in the movies only peaked at 1500m/s2 (150g). However, Sutton's calculations based on the Bennet-Clark lever model worked perfectly, accurately predicting the insect's trajectory and acceleration pattern. So Sutton and Burrows have finally settled the argument and resolved how fleas jump. The insects transmit the force from the spring in the thorax through leg segments acting as levers to push down on the tarsus (toe) and launch the 0.7mg animals at speeds as high as 1.9m/s. New research from the University of Pennsylvania is challenging some longtime assumptions about why human beings seek and keep their friends, and it reveals a somewhat darker side to the very nature of friendship itself. 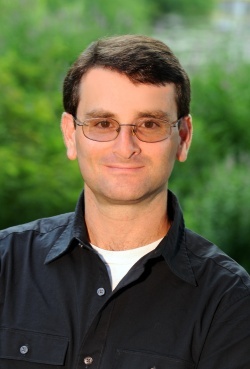 Peter DeScioli, who recently earned his Ph.D. at Penn and is currently a fellow at Brandeis University, says his recent research, completed in conjunction with Robert Kurzban, Penn associate professor of psychology, and researchers at two other universities, offers new evidence supporting the so-called "alliance hypothesis" of friendship, which states that individuals' feelings about their friends are based mostly on how those friends feel about them. This alliance hypothesis, which also states that friendships are valued because of their usefulness during times of conflict, contrasts with the more conventional "reciprocity" theory of friendship, which holds that humans make friends mostly in order to reap the reciprocal benefits of those friendships. The findings were published on Feb. 3 in the journal Perspectives on Psychological Science. "Traditionally, one of the main theories about friendship is that friendships are essentially trade relationships," DeScioli said "You do things for your friends, and they do things for you. The problem with this theory is, if it were true, then we should be good accountants and keep track of what we do for friends and what they do for us. There is evidence, however, that we don't do that." To figure out, then, if human beings make friends for reasons other than "trade," the researchers hit the Internet. Specifically, they went to MySpace, the social networking site that, unlike other sites, allows people to "rank" their friends. Leveraging a massive database built from the site — about 11 million data points in all — the researchers set to out to determine how much of a factor "friend rank" played in an the perceived strength of friendships. As it turned out, that rank was of massive importance. Kurzban explained that, if Joe Smith was ranked No. 1 by one of his friends, he was significantly more likely to also rank that friend in the top spot. For example, the results showed that, comparing first- and second-ranked friends, 69 percent of people chose as their best friend the individual who ranked them better. And while other factors also played a role in how friends valued their friends — geography, for instance — none of them played as great a role as rank. The bottom line? People greatly value those friends who greatly value them above others. They are less impressed with those who rank them lower. We are, it seems, very jealous beings. "If you think about friendships in terms of alliances, in the context of game theory and international relations, one of the main things you'll find about allies is that they are fundamentally jealous of each other,” DeScioli said. “If Saudi Arabia is allies with the United States, it's not just concerned about its relationship with the United States. It's also concerned about the relationship that the United States has with other nations such as Iran. In reciprocal or exchange relationships, you don't care about how, for example, Wal-Mart feels about other people. You just care about what you're getting out of the relationship." This dynamic is so important, the researchers suggest, because humans apparently see their friends as protection — not to mention valuable assets that can be leveraged when conflict arises. "You have to build friendships in advance," DeScioli said. "You have to build a network of people who care about you, before any arguments or scuffles come up. That's the theory, that humans create these networks so we can potentially use them in the future. When you have this network of allies, you don't have to worry about direct reciprocity." In a paradox typical of the quantum world, JILA scientists have eliminated collisions between atoms in an atomic clock by packing the atoms closer together. The surprising discovery, described in the Feb. 3 issue of Science Express, can boost the performance of experimental atomic clocks made of thousands or tens of thousands of neutral atoms trapped by intersecting laser beams. JILA scientists demonstrated the new approach using their experimental clock made of about 4,000 strontium atoms. Instead of loading the atoms into a stack of pancake-shaped optical traps as in their previous work, scientists packed the atoms into thousands of horizontal optical tubes. The result was a more than tenfold improvement in clock performance because the atoms interacted so strongly that, against all odds, they stopped hitting each other. The atoms, which normally like to hang out separately and relaxed, get so perturbed from being forced close together that the ensemble is effectively frozen in place. "The atoms used to have the whole dance floor to move around on and now they are confined in alleys, so the interaction energy goes way up," says NIST/JILA Fellow Jun Ye, leader of the experimental team. Ye also is an adjoint professor of physics at CU-Boulder. How exactly does high interaction energy—the degree to which an atom's behavior is modified by the presence of others—prevent collisions? The results make full sense in the quantum world. Strontium atoms are a class of particles known as fermions. If they are in identical energy states, they cannot occupy the same place at the same time—that is, they cannot collide. Normally the laser beam used to operate the clock interacts with the atoms unevenly, leaving the atoms dissimilar enough to collide. 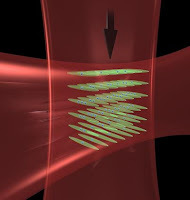 But the interaction energy of atoms packed in optical tubes is now higher than any energy shifts that might be caused by the laser, preventing the atoms from differentiating enough to collide. The idea was proposed by JILA theorist Ana Maria Rey and demonstrated in the lab by Ye's group. Other co-authors of the study were Matthew D. Swallows, Michael Bishof, Yige Lin, Sebastian Blatt and Michael J. Martin. Given the new knowledge, Ye believes his clock and others based on neutral atoms will become competitive in terms of accuracy with world-leading experimental clocks based on single ions (electrically charged atoms). The JILA strontium clock is currently the best performing experimental clock based on neutral atoms and, along with several NIST ion and neutral atom clocks, a possible candidate for a future international time standard. The devices provide highly accurate time by measuring oscillations (which serve as "ticks") between the energy levels in the atoms. In addition to preventing collisions, the finding also means that the more atoms in the clock, the better. "As atom numbers increase, both measurement precision and accuracy increase accordingly," Ye says. To trap the atoms in optical tubes, scientists first use blue and red lasers to cool strontium atoms to about 2 microKelvin in a trap that uses light and magnetic fields. A vertical lattice of light waves is created using an infrared laser beam that spans and traps the atom cloud. Then a horizontal infrared laser beam is turned on, creating optical tube traps at the intersection with the vertical laser. University of British Columbia researchers have uncovered the unique survival mechanisms of a marine organism that may be tiny, but in some ways has surpassed sharks in its predatory efficiency. 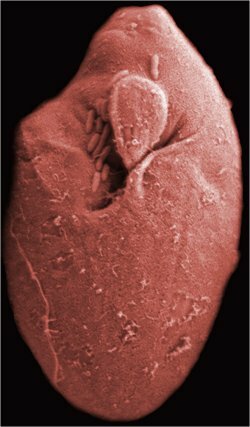 Published in the journal Nature Communications, the research team’s portrait of the microscopic dinoflagellate Oxyrrhis marina reveals a predator so efficient that it has even acquired a gene from its prey. “It’s an interesting case of Lateral Gene Transfer, or the movement of genes between distantly related species,” says Patrick Keeling, a UBC botany professor and one of the study’s authors. Humans possess similar proteins in our eyes, called opsin, that enable vision in low-light conditions, but cannot produce energy. Oxyrrhis marina is part of a family of marine plankton that also includes the organisms responsible for harmful red tides. It is common in shallow waters such as tide pools around the world, including along the British Columbia coast. It has evolved extreme survival mechanisms, including the ones described in the UBC study. Oxyrrhis marina can cannibalize its own species when no other prey is available.